Aiming to influence early career choices, Fives Cincinnati recently hosted 19 students from 17 area high schools attending Northern Kentucky University’s Engineering Technology Camp. The students received a guided facility tour where they enjoyed explanations of Fives own manufacturing processes. They also received detailed descriptions of aerospace composites technology, layup systems and metal cutting systems being built by Fives for customers. 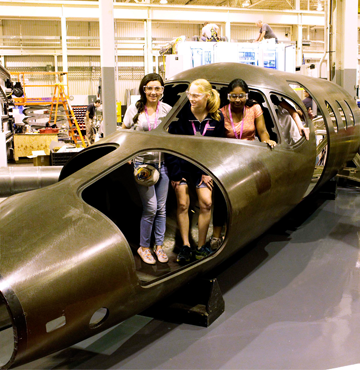 Hands-on exposure to semi-finished aerospace components reinforced the experience. Fives is a recognized leader in workforce development and apprenticeship programs for the technology sector. Since 2005, the company has invested more than $2 million in apprenticeship training alone. The company also recently participated in the White House Upskill Summit, a national initiative launched by President Obama aimed at equipping workers with skills they need to earn, and advance in, higher-paying jobs. With a strong foundation based upon renowned brands such as Cincinnati, Giddings & Lewis, Forest-Liné, Liné Machines and Rouchaud, Fives is recognized as the preeminent provider of outstanding manufacturing solutions which are at the heart of its customers’ performance. Metal Cutting | Composites dedicated teams – approximately 1200 people in over 15 countries – serve key industrial markets including aerospace, automotive and truck, heavy equipment, oil and gas, rail, wind, energy and general machining. With manufacturing and support operations strategically located worldwide, Fives and its Metal Cutting & Composites businesses offer comprehensive lines of equipment and technologies including automated assembly, laser welding and cutting, turning, milling, composites processing and software with the associated support services (maintenance, spare parts, retrofit, overhauling and upgrading).